Spend a few moments with the guy who commissioned the Ford GT Future Forty. 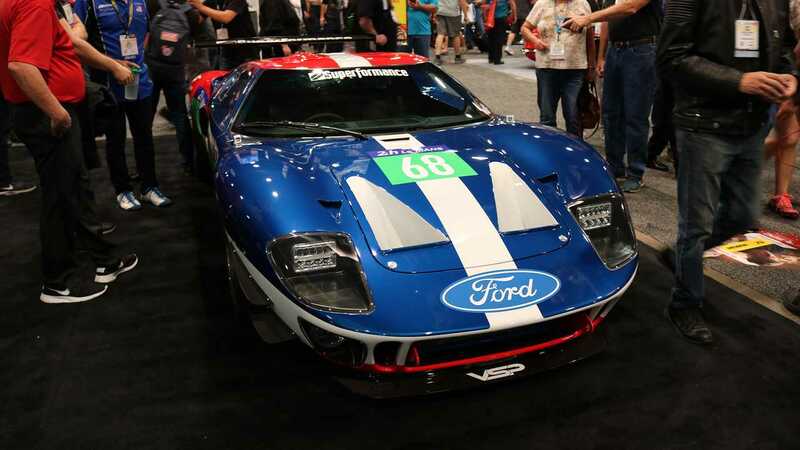 One of the coolest cars at this year's SEMA Show is the Superformance Mk1 Ford GT40 replica with a twin-turbo 3.5-liter EcoBoost V6 engine from a modern Ford GT behind the driver. It goes by the nickname Future GT Forty. Motor1.com got the chance to talk with Doug Campbell, who commissioned the car, and he discussed his high-speed plans for the machine. The idea for the Future GT Forty started with Campbell's intention to paint a classic GT40 like a new one. From this inkling, he decided to take the additional step of using the modern powerplant, too. Two Honeywell Garrett turbochargers push air into the cylinders, and the gases exit through a custom Magnaflow exhaust. The chassis is a mostly stock Superformance Mk1 Ford GT40 replica with right-hand drive and right-hand gearshift. While the GT40 is drivable currently, there's still some work to do. The turbos are only running at 12 pounds of boost now, providing around 500 horsepower. Pumping them up to 20 pounds of boost and fueling the V6 with E85 should push the output to around 700 hp and 650 lb-ft of torque, according to Campbell. Once the final tweaks are done, Campbell plans to take the Future Forty to high-speed events where he's hoping to hit 215 miles per hour (346 kilometers per hour). The current gearing limits the top speed to 228 mph (367 kph). If you haven't heard the Future GT Forty yet, check out the video above to listen to it start up and throw some revs. We can't wait to hear what the powertrain sounds like once Campbell has the car done and can fully unleash the power.